It's simple, decide which project you want to create ... a scarf, hat, snood, muff, even a bag. Then follow the step-by-step instructions provided on the box and watch your design take shape! 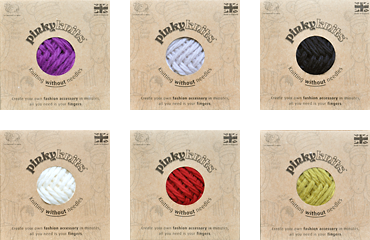 Give us your email address and we'll let you know about new Pinkyknits products. Pinkyknits is the new and exciting way to create your very own fashion accessory. In minutes you can make a 'knitted noodle' – with only your fingers! - there is no need for needles! Create scarves, bags, belts, hats, mufflers, cushions, snoods and more … The only limit is your imagination! We are proud of the fact that Pinkyknits is designed and manufactured entirely in the UK by Laxtons Specialist Yarns, using 100% Wool, in collaboration with Erika Knight. Pinkyknits supports The Campaign For Wool, whose Patron HRH The Prince Of Wales is putting wool at the forefront of fashion, interiors and accessories. Pinkyknits is an ideal source of education for children, learning new skills and using wool, and will give a sense of achievement for all.